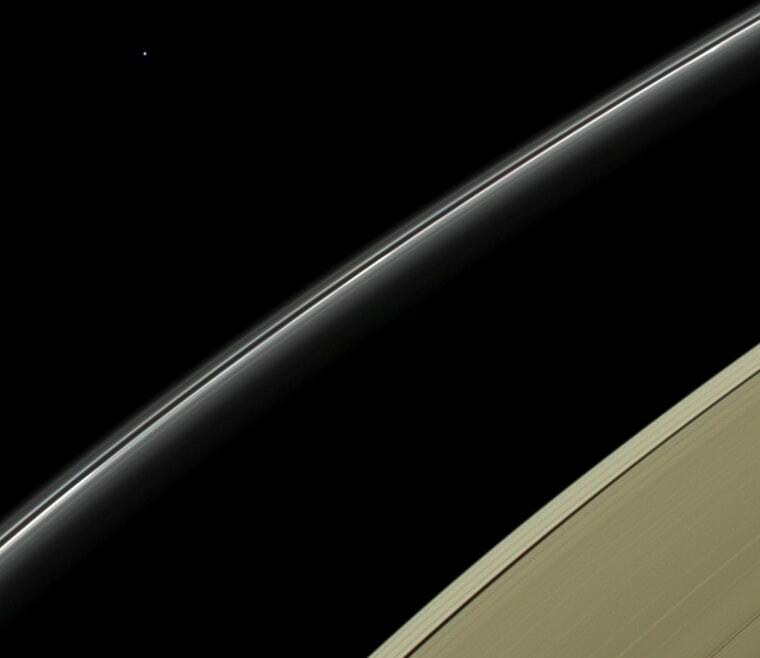 NASA's Cassini probe has followed up on its famous "Pale Blue Dot" picture of Earth as seen from Saturnian orbit by zeroing in on another blue planet. This time, Uranus is taking the spotlight, for the first time in Cassini's nearly decade-long mission at Saturn. The true-color picture, captured by Cassini's narrow-angle camera on April 11, shows Saturn's rings in the foreground, from a distance of about 614,300 miles (988,000 kilometers). Uranus' icy blue disk is much farther away — about 28.6 astronomical units, or 2.7 billion miles (4.3 billion kilometers). Earth is blue because of its oceans of water — but Uranus is blue because the ice giant sports an outer atmosphere of methane gas, which reflects blue wavelengths. For more about both "Pale Blue Dots," check out the image advisories from NASA's Jet Propulsion Laboratory and the Cassini imaging team. Two members of the team behind "In Saturn's Rings," Val Klavans and Ian Regan, provide an in-depth look at Cassini's Uranian imagery on the Planetary Society's website.